SO FAST AND EASY! 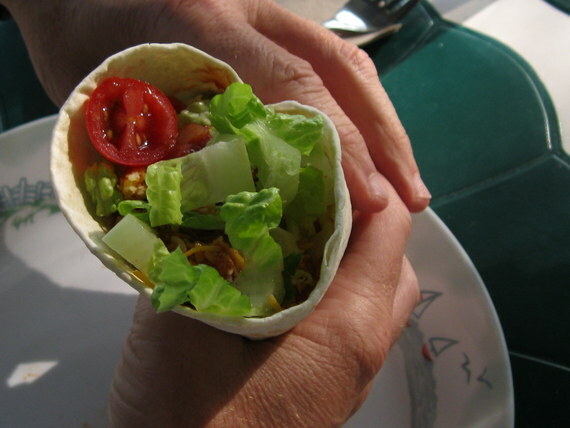 THESE TACOS WILL SATISFY YOUR TASTE BUDS AND KEEP YOUR CHOLESTEROL AT BAY! 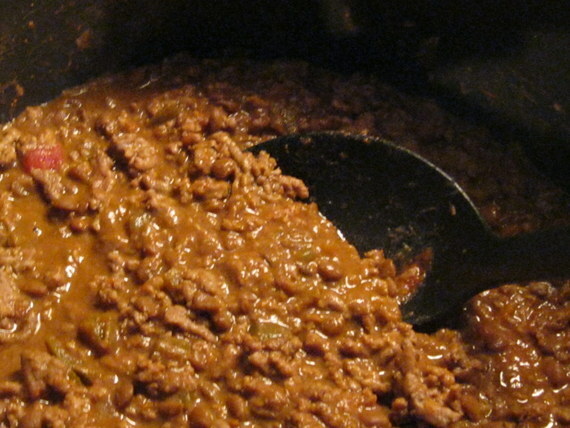 In a large skillet over medium high heat brown ground beef and add lentils, taco seasoning, 1/4 c water and 1/4 cup salsa. 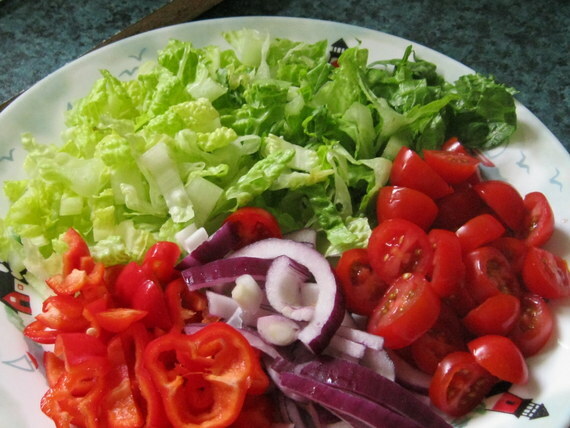 Chop up your lettuce, tomato, onion and peppers. Create your taco! I like mine open like a taco salad but my husband likes to wrap his. THESE ARE DELICIOUS AND NO ONE KNOWS THERE ARE LENTILS IN THERE. THE LENTILS HELP DECREASE TOTAL FAT AND ADD FIBER. USING 96% LEAN GROUND BEEF AND LOW FAT SOUR CREAM ALSO KEEP THE MEAL HEALTHY – THEN I DON’T FEEL GUILTY ABOUT HAVING A FEW TORTILLA CHIPS WITH IT! 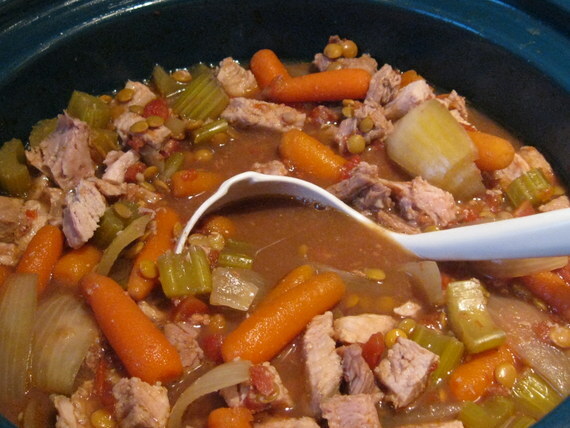 Place everything in order into the crock pot and cook on LOW 10-12 hours. In the last hour of cooking take out roast and cut into cubes, then return to slow cooker until ready to serve. Add all to large soup kettle. Bring to boil, then cover and simmer about and hour. Soup will thicken over time so I usually add the higher end of the broth and don’t worry about draining the spinach! 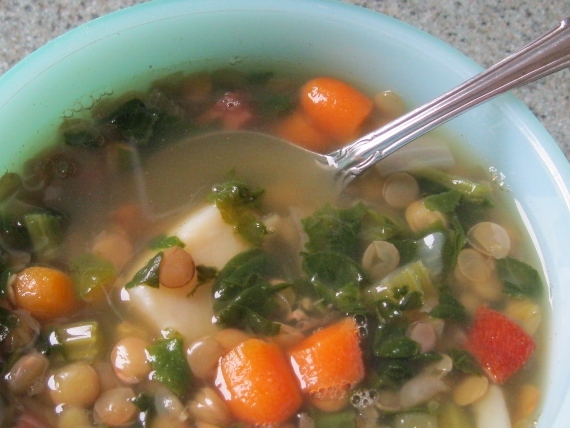 **THE INGREDIENTS FOR LENTIL AND SPLIT PEA SOUP ARE ALMOST IDENTICAL BUT THEY DEFINITELY EACH HAVE A DISTINCTIVE FLAVOR! ALSO GREAT WITH A LEFT OVER HAM BONE OR HAM HOCK. Lentils are naturally free of gluten but as with other gluten-free legumes and grains, there may be risk of contamination during processing and handling. Always give dried lentils a thorough rinsing before cooking them. To play it safe, seek out packaged brands that are certified gluten free, like those from Arrowhead Mills. When asked who my “Health Hero” is and why, I immediately thought of my father. Not only was he a World War II hero, he made sure to bring our family up to be active. We would go to the beach and swim and build sand castles and he would organize a baseball game if we started lazing around too much. We played tennis, badminton and horse shoes and always took walks. The entire family raked leaves and shoveled snow together. We washed the car and we all had household chores. Stuart McIntosh, former Olympian said, “When children are exposed to a routine that works, they learn it, understand it, and when done regularly it is locked into their memory.” It sure worked for our family! Now it is up to me to continue to make healthy lifestyle choices. My husband and I really work as a team. When his cholesterol level inched up to 199, my training as a Registered Dietitian kicked in and we were able to lower that level by 20 points over the last year. Difficult for a real meat and potatoes man! We ate more fish (grilled and cooked with a variety of spices), less chuck roast (20gm fat/serving) changed to tender chuck (3gm fat/serving), more beans and lentils added to ground beef dishes and using 96% lean beef (like meatballs, meatloaf, tacos, chili). Haven’t seen a hotdog bologna, salami, bacon or sausage – but like turkey sausage! Milk products are all low fat and fresh fruits and vegetables are always “half the plate”! Whole grains are staples. A stick of butter lasts months. I don’t use artificial or “lite” products but use just a little of the real thing. Most important we EXERCISE DAILY! We just went through a winter of extreme cold, life threatening wind chills and two blizzards in Buffalo, New York. But we dressed for the weather and enjoyed cross county skiing and walks/snow shoeing along the frozen Lake Erie shoreline at sunset not to mention we did loads of shoveling. My husband also likes to kite ski. We even have cleats for our boots for the typical ice storm. The treadmill and exercise bike are a last resort to enjoying the great outdoors. IT IS IMPORTANT TO HAVE A PLAN FOR HEALTHY EATING! You need only a very small plot of land to grow enough vegetables and herbs to feed a family. Join me in this experiment. Take a 2 cubic feet of potting soil (like Miracle Grow), rumple it around quite a bit to loose the soil, poke quite a few holes in the back side for drainage, then lay the bag on a smooth surface that will allow drainage and not get too hot. Cut out the top leaving about a 4 or 5 inch border all around. Lightly rake through the soil to even it out and loosen it even more, then carefully start planting your seeds. Spray mist the seeds and plantlings when first watering until they are established, then you can water more vigorously. Keep soil moist, but not sopping wet. Come Summer, we plan to have loads of fresh vegetables for grilling and salads! Summer plans also include tennis, biking, swimming, kayaking, windsurfing and paddle boarding. REMEMBER, YOU DON’T HAVE TO DIET IF YOU LIVE IT! MUST TRY! ONE OF THE WAYS I’M FIGHTING HIGH CHOLESTEROL! Here is my really great recipe for super protein, low fat meatballs (I also make into burgers to cook on the grill)! Mix all ingredients in a large mixing bowl and let sit in refrigerator for about an hour (the quinoa will absorb extra liquid and make for more solid burgers and meatballs that hold together). Fashion into 2 good sized burgers (to freeze for later grilling) and 20 large meatballs. Bake meatballs at 375 degrees 20-25 minutes until browned and firm. I usually freeze and add to my homemade sauce as needed! **Sometimes I add a tsp of cumin or chili powder to spice them up, or if I’m thinking of beef stroganoff with Swedish meatballs, I add a tsp of ground all spice! MEAT & POTATOES MAN LOWERS CHOLESTEROL! CELEBRATE WORLD HEART DAY! WE WERE ABLE TO LOWER MY HUSBAND’S TOTAL CHOLESTEROL BY 20 POINTS OVER THE PAST YEAR AND HE IS A MEAT AND POTATO MAN! Yes, we ate more fish (grilled and cooked with a variety of spices), less chuck roast (20gm fat/serving) changed to tender chuck (3gm fat/serving), more beans and lentils added to ground beef dishes and using 96% lean beef (like meatballs, meatloaf, tacos, chili), haven’t seen a hot dog, bologna, salami, bacon or sausage – but like turkey sausage! Milk products are all low fat and fresh fruits and vegetables are always “half the plate”! Whole grains are staples. A stick of butter lasts for months. Sweet treats are not in the house unless we’re having company but I still try for something as healthy as possible. I don’t use artificial or “lite” products but use just a little of the real thing – seems to work! I don’t like the idea of cholesterol lowering medicines so give this a shot! AND DON’T FORGET TO EXERCISE DAILY! JUST AN ASIDE: My Mom had a cholesterol level over 300 for much of her adult life, yet when she was developing dementia and they checked her arteries for plaque, the doctors said “she has the arteries of a 16 year old!” Not to make light of cholesterol but your gene pool, diet, environment and life style have a strong influence on developing heart disease! Mom died at the age of 88 and four days of old age! In large bowl combine ingredients. Refrigerate about an hour to allow quinoa to absorb some of the liquid. Then shape into loaf, balls or patties. Cook loaf in 350 degree oven for about 40-45 minutes. Cook balls in 350 degree oven about 20 minutes. Grill patties about 10 minutes a side. *Sometimes I add worcestershire sauce and/or ketchup for a little different flavor. FOR TACOS BROWN 96% LEAN GROUND BEEF WITH A CAN OF LENTILS AND ADD YOU FAVORITE TACO SEASONING – NO ONE WILL KNOW THE LENTILS ARE THERE! 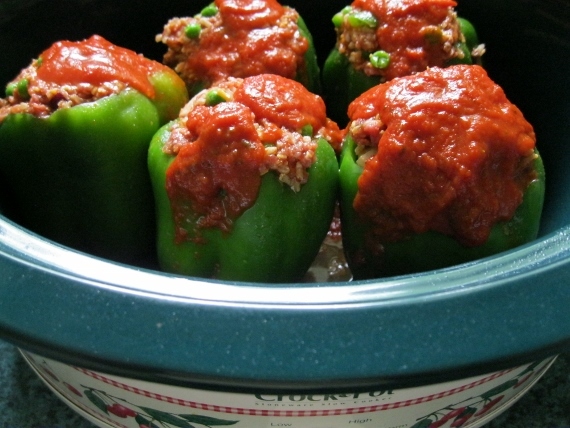 MAKING THESE IN THE CROCK POT KEEPS THE HEAT DOWN ON THESE HOT SUMMER DAYS! Remove tops, core and seed peppers. In medium bowl mix remaining ingredients with 1 cup spaghetti sauce and cheese. Fill peppers with mixture. Pour 1/2 cup spaghetti sauce plus 1/2 cup water into slow cooker. Stand pepper upright in slow cooker and cover. Cook on LOW 5-7 hours (HIGH 2 1/2-3 1/2 hours). I like them with extra sauce and grated parmesan cheese!